Brighten up any backyard party or pool time fun with a colorful light up beach ball from LED FURY! If you love throwing parties, having fun with friends, or getting a little wild at the pool or the beach, nothing makes your night time experience more exciting than throwing a LED FURY Light Up Beach Ball into the mix. Fun for all ages, both kids and adults love the unique color changing effect ! We know that once the party begins, this ball may fly around and reach sensitive areas. That’s why we designed it without any protruding sharp edges or messy glow sticks / tubes. The batteries that provide power are properly encapsulated and secured in safe plastic. To activate the lights all you do is press the on/off button and the party is on! At 15” in diameter, these large beach balls are great for playing games, bouncing, tossing, playing catch, and so much more. And with hours of beautiful, vibrant color-changing lighting and glow-in-the-dark fun, everyone can get in on the action. if you are looking for light up party supplies or glow in the dark party supplies then look no further! 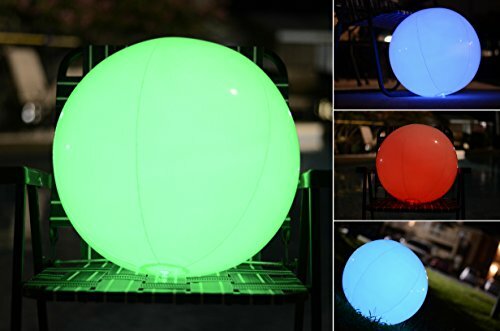 Get this colorful, bouncy LED ball perfect for fun at home, the beach, or anywhere there’s a party ! Bright, Colorful Glow - This light up ball glows in the dark and features color-changing LED lights on the inside that scroll through multiple colors while playing! Enhance the Party Experience - LED FURY glowing balls are great for pool parties, nights at the beach, birthday parties, wedding receptions, or glow in the dark parties. A great substitute for LED balloons! Durable, Waterproof - Each LED ball is made with high-quality PVC plastic. Great for kid and adult play. Long-Lasting LED Lighting - This LED light up beach ball features an on/off power and non-removable batteries that can last 100 hours depending on usage. 5-Star Service Guarantee - Every glow ball that we create is guaranteed to be durable, colorful, and light up; contact us with any quality control issues for support. If you have any questions about this product by LED FURY, contact us by completing and submitting the form below. If you are looking for a specif part number, please include it with your message.